It was a cold and rainy weekend. But it was also an extra hour in bed weekend; a dark Sunday teatime lit up by sparkling birthday candles weekend; a hurry into the car to go to Granny's and help celebrate her 83rd kind of weekend. Which made it a good one. When we weren't baking a birthday cake or wrapping up that mantelpiece clock, found late on Saturday afternoon, or beating up another badge of fudge (special order), we were turning out all the wardrobes so that we could fill as many bags as we could to raise "cash for clobber". 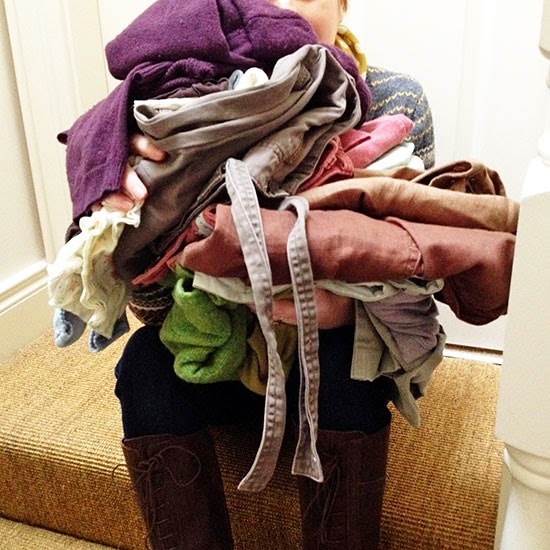 We bin-bagged up all our old clothes and then we went to Granny's and started on anything she had to donate. I'm still reorganising what I have left; and because we were talking yesterday about needlework projects from the past, I've been going to the very back of the wardrobe and discovering treasure. 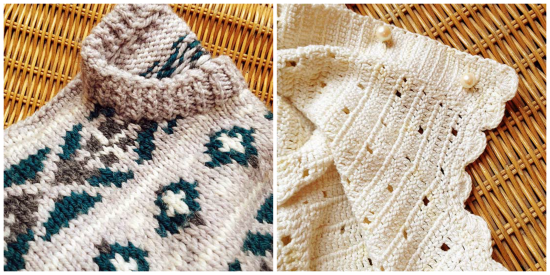 Yesterday Granny talked about her very first knitting project, her first crochet, and today I found two things she made for me when I was a student: a crochet cardigan and a thick Fair Isle sweater. Some things can be moved on, some things are for saving. I don't think I'll be moving these two on because,as my Grandma always used to say, "keep a good thing long enough and you'll be glad of it". Or something like that. But this lot is going..
And that's Me On Monday. If you'd like to "Monday" too, give me a wave! I'd love to come and wish you a great week. Last week Helena, Deb, Jane, Ruth, Becky, Kirsty, Ladkyis, Karen, Fiona, Alison and Liz all gave us a peep into what they'd been up to and what their week might hold. Thank you! that fair isle is amazing! definitely a keeper! I've been sorting/selling/giving through everything I have lately, only 25 and i have so much stuff it's insane so I can't imagine what it would be like when I'll be 83!! I can remember my gran knitting fair isle without even looking at her stitches! That fair Isle jumper is definitely a keeper - beautiful pattern! Happy Birthday to Granny! My latest post is not so much a weekend catchup - more the last few months, oops! Pleased to hear you found the right clock in the nick of time! Hope Granny had a lovely day with her family around her. Those hand made items are fantastic, absolutely no way they are ever going to end up in a charity bag! Glad you found the clock in time and what fabulous finds in your wardrobe. I still have the very first Aran sweater I knitted and I look forward to some really cold weather when I get to wear it again - nothing like a nice snuggly handknit for keeping warm. Hope you managed to collect a lot of clothes - is that for the fundraising? Love that jumper, it is great that these have come round again :-) Have a great week! Do hope Granny had a fantastic birthday! Are't you lucky she kept such treasures? My dad always said, "there's nothing new under the sun; why does youth think it invented everything?" He had a point. "Cash for clobber " is that a bit like a garage sale? I have also been wondering who is making this fudge? Is it you or is it the fundraising daughter? I have a few hand knitted articles of clothing made by my mum, and they're so precious. You are quite right Sian, some things can never be parted with. Happy birthday to your Mum, I hope she enjoyed the fudge and cake. How lovely to still have those. Well done on such a good clear out. I'm waving back to you a day late this week! That fair isle sweater is absolutely gorgeous! They were popular here when I was in college, but for the most part well out of my budget (at least for anything authentic). My mom did get me a cheap knock-off one for Christmas one year but it was so itchy I couldn't wear it and it shrunk terribly the first time I washed it. Now I'm feeling all nostalgic about it! Like Cheri, I have 'itchy' memories of fairisle jumpers...what treasures though! Happy to know you found the clock you were looking for. It seems to me that going through closets and sorting out for charity is nearly endless process. After just a few months, there seems to be another pile ready to go! I love that sweater! What a treasure to rediscover. Hope the fudge went well! Yummy! birthday sparkles, found treasures and extra time together - a good weekend indeed. What a busy weekend - how FUN to celebrate Granny's birthday! And great job on the decluttering and donating! Good for you on emptying closets (my task for tomorrow!). Handmade things are in your genes I think--not only do you appreciate what others made for you, but you are an artist in so many ways. It's so nice you still have those things your Granny made you - and yes they are for saving. We need to do a closet cleanout!